Will (Homepage) wrote: BION I'm ipmressed! Cool post! Nick (Homepage) wrote: Nice greens and detail. rtherianto.net (Homepage) wrote: Nice shade and color. Well done mate. Andres (Homepage) wrote: Amazing macro. Its so clear. Cool colours. gavin hart (Homepage) wrote: Nicely composed. The soft focus on the right hand side effectively directs attention to the main leaf on the left side with all its intricate detail.The light on the leaves makes a nice glow, especially against the dark background. Pedro (Homepage) wrote: Excelent shot & title, regards. Ágarðr (Homepage) wrote: Fantastic shadowplay! Miro at LightIsAllAround.com (Homepage) wrote: Simple and still nice composition, I like a lot green colors and interesting structures. Well done. AC (Homepage) wrote: Very creative snap. Love the details on the serrations and the veins in the leaves. Chris Cardelli (Homepage) wrote: Wow! These are leaves as mountain peaks. Very nice image. Andy (Homepage) wrote: Wow great macro photo. Love the shadow of the leaf! Laurie (Homepage) wrote: Beautiful. I love the light here. Well done. sherri (Homepage) wrote: Incredible detail. I like it that the one leaf is flawed. Becky (Homepage) wrote: I love your creative way of seeing things! Marcie (Homepage) wrote: Exceptional detail. Wonderful image! Siam (Homepage) wrote: Very beautiful embellish with images this sheet a magnificent green. Angelique (Homepage) wrote: Beautiful light, compo and colors. Perfect shot. Ray (Homepage) wrote: Love the abstractness of this ! dewaun.simmons (Homepage) wrote: great details. clarity is fantastic. Love the overlapping of the two leafs and the crisp veins. Nice work. Arjan - PlasticDaisy (Homepage) wrote: Love the overlapping shadow! And the detail is amazing. Like little veins! ceanothe (Homepage) wrote: Un beau jeu entre l'ombre et la lumière ! cashondeo (Homepage) wrote: Tanto la luz como el tono verde de las hojas es muy bueno, asi como es sombra que las divide ! grant (Homepage) wrote: that overlap is great! LGB (Homepage) wrote: Another beautiful one. So simple and so gorgeous! Great work! Andrew (Homepage) wrote: Awesome macro with great detail and color! The additional shadow is a clever touch. Great image! Zing (Homepage) wrote: Loving this! Great details and nice green colour. Elaine- (Homepage) wrote: veeeerrrryyyy interesting!! a neat trick of the eye, i like it alot! Terry H. (Homepage) wrote: Wonderful composition and lighting. The shadow leaf was a great idea! John Maslowski (Homepage) wrote: A stunning image, simply surreal. Love the veins and lighting. Great job! 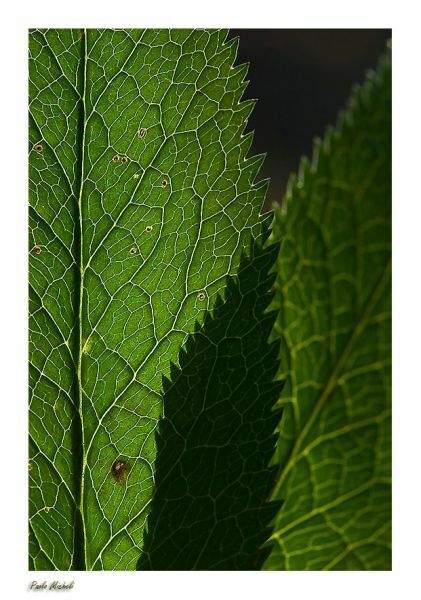 martie (Homepage) wrote: Fantastic macro - especially the use of the shadow leaf!! Paolo (Homepage) wrote: grande composizione, bello anche il gioco della profondità di campo. grant (Homepage) wrote: beautiful deep color and crisp detail.